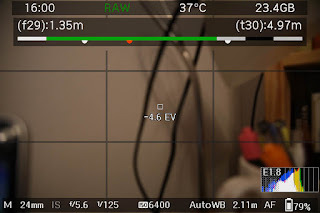 In this post, and in future ones, I'll provide some examples of using the DoF Bar; but before doing so, let’s remind ourselves what DoF Bar looks like if we are ‘simply’ using it to provide DoF feedback associated with the single image we are attempting to take. The DoF Bar menu looks like this. 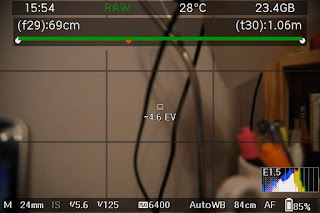 Here, in this example, 'Show Bar' is ON, if it was 'OFF', DoF Bar would be hidden in LV; The minimum focus is set at 700mm; Bracketing of set to OFF; and Pro Mode (not discussed in this post) is set to Blurs. Finally, the the dynamic bar option is set to DoF (my preferred option). 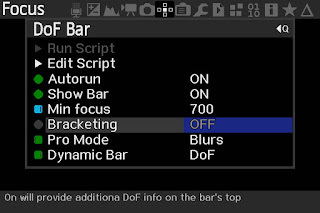 In addition, DoF Bar provides additional blur information associated with 'infinity focusing', ie focusing beyond H and less than the Canon reported infinity. When infinity focusing, the far (sic) DoF blur becomes less than that which is active when you are focusing at less than H.
Thus, if you see an ‘i’ in front an ‘f’, ie ‘if’, you know that blur refers to the infinity state. To illustrate how to use DoF Bar, the use case we will look at in this post, is how to set focus for maximum depth of field and (sic) best image quality. 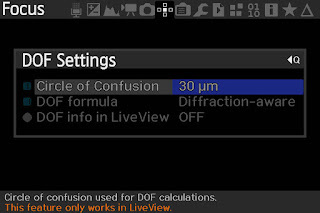 First, as we are seeking best image quality we need to be sensitive to diffraction, so we will switch that on in the ML Focus Menu. In this case, we will use the 'normally accepted' full frame total blur criterion of 30microns and we will switch on diffraction aware. We also note that an lens’s overall quality varies as we increase aperture; and many photographers recognise there is a sweet spot about (sic) a couple of stops down from the lens’s widest aperture. For example see https://www.cambridgeincolour.com/tutorials/lens-quality-mtf-resolution.htm. Here we see we are at an aperture of F/5.6 and that DoF Bar is reporting a near DoF distance of 69cm with a (de)focus blur of 29microns, and a far DoF distance of 1.06m with a total blur of 30microns, as one would expect, as we have set 30microns as our criterion in ML. ML is also reporting (bottom bar) that the focus is at 84cm. Note that if we are focused short of the hyperfocal distance, the end of the green bar, then, by definition, the blurs at the near and far DoFs are the same. 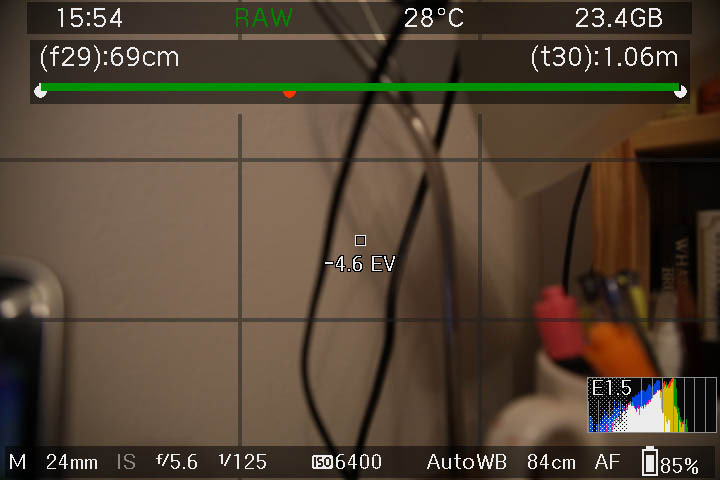 Thus although the near DoF above is reporting 29microns of defocus blur, this is the same at the far DoF. Likewise, the total blur of 30microns at the far DoF, is the same at the near DoF. Let’s now refocus towards infinity and stop when the far DoF just goes past the hyperfocal. Now we see the DoF Bar format has changed, with two additional bars coming into play. The left hand one being a visual aid, set by the user as the min focus, ie 700mm in this case. The right had bar is sub-divided into three zones, covering H-2H, 2H-3H and 3H-4H. In this example the near DoF has moved to 1.35m, the far DoF at 4.97m and the focus at 2.11m. The blurs, of course, have not changed. Lets now continue focusing, to just beyond H and shut our aperture down to a more sensible F/11. 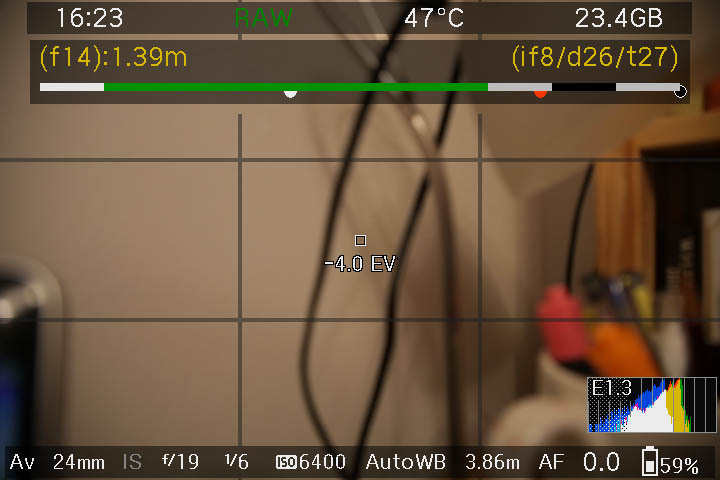 Here we see at a focus of 3.86m, the DoF Bar is report the near DoF distance as 1.34m, with a focus blur of 26microns now as we have changed the aperture, and, as we are at/beyond the hyperfocal, DoF Bar now switches from showing the far DoF distance, which is infinity, to showing us infinity blur information, ie the blur at infinity. The additional information we see is that the infinity focus blur has dropped to 14microns, the diffraction is at 15microns and the total blur is 20microns. Thus the far quality of focus is now better than at the near DoF, where the total is, of course, still 30microns. 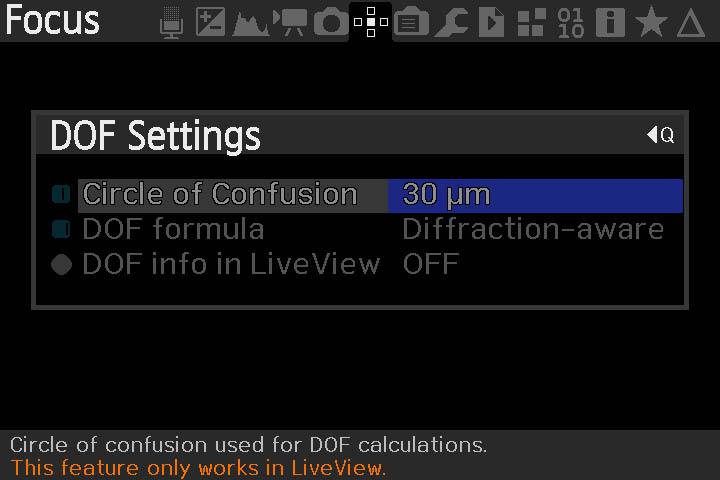 We also see the text colour has changed from green (not shown) to yellow, warning us that the diffraction blur is larger than the defocus blur. 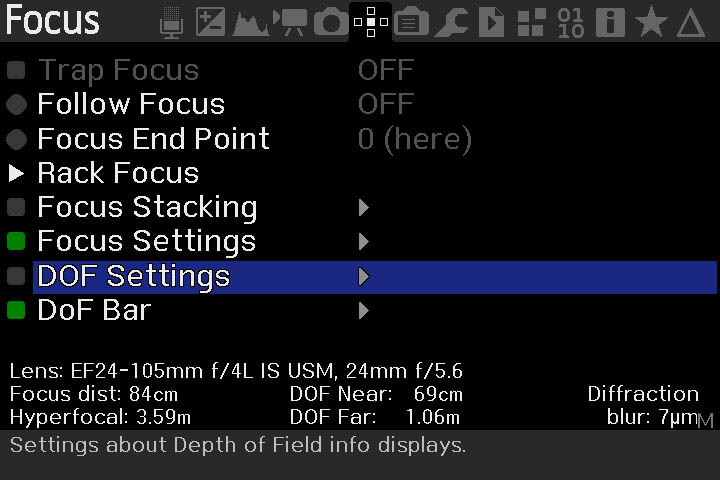 Without DoF Bar we simply would not be aware of this additional focusing information; as once we have gone past the hyperfocal distance, ML provides us no additional information, other than the focus distance. But we know that, as our focus approaches infinity, the defocus blur of the lens reduces to zero, at infinity. That is, once past the hyperfocal distance, the focus quality between the focus point and infinity, keeps getting better. But, as we know, if we focus at infinity, the near DoF is at the hyperfocal distance. So, once we have achieved the required focus quality, there is little point keep focusing towards infinity, as you are losing near DoF. Or put another way, the near DoF, from the hyperfocal distance (H) to infinity, reduces from H/2 to H: thus if your near DoF needs are meet by a near DoF of H, then you can safely focus towards or ‘at’ infinity. 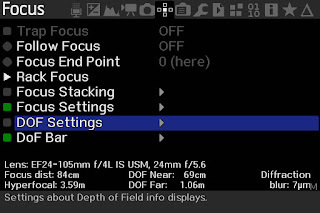 But what is you need to maximise the near depth of field? What should you do? 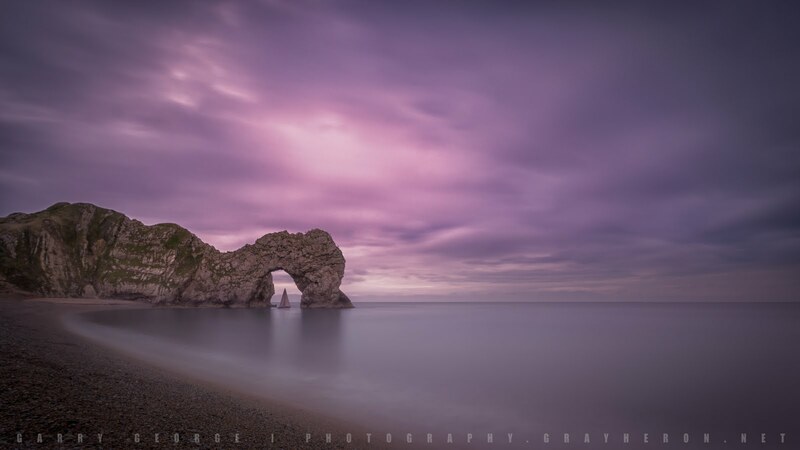 Most photographer will approach the above by decreasing the size of the aperture, knowing that doing this will, and ignoring diffraction, increase their DoF, ie make their near DoF as close to the camera as possible. So let’s do that. Let’s leave focus where we are and simply keep shutting the aperture down. BTW if the infinity blur information turns red, then we are focusing beyond 4*H and are likely seeking defocus blurs smaller than is sensible with the sensor, ie less than two sensor wide. The near DoF is now at 1.23m and the defocs blur at the near DoF is 21microns. We also note the diffraction blur is 21microns, the defocus (infinity) blur is 10microns and the total blur is now 23microns. At F/22, there is no solution, and at F/19 the near DoF is at 1.39 at a defocus blur of 14microns, ie we have lost depth of field because, of course, diffraction is beating us. Also the total infinity blur is now up to 27microns. Remember that ‘focus quality’ is a root mean square addition of the lens defocus blur and diffraction blur. So it looks like that F/11 was best for gaining the most near DoF and getting the infinity blur as low as possible. Thus, at a focus distance of 5.24m and at an aperture of F/11, the near DoF, which meets our ML set criterion, is 1.47m, and the overall blur at infinity is 18microns. Knowing that ‘best’ lens quality will be found at around F/11, means this is a good place to finish focusing. Hopefully this quick introduction to DoF Bar has provided sufficient information to allow others to experiment with focusing by blurs. 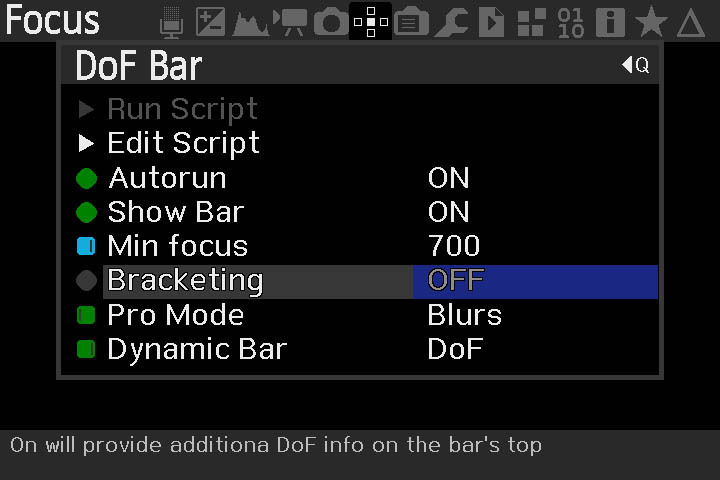 In future posts I’ll provide insight into one of the main features of DoF Bar, namely focus bracketing.